So I worked a little bit on MidSpace for the Odyssey 2 the past few days. I added in a couple things. 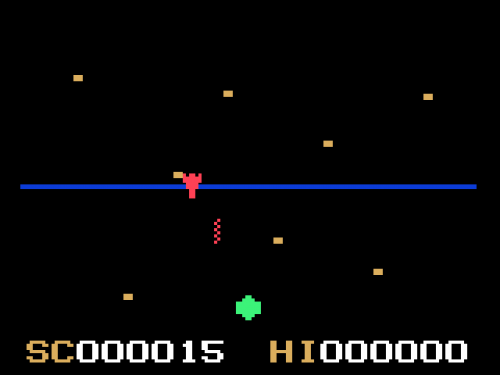 One thing I added in was missiles that move towards you to try and get you. Every UFO can shoot these. My original plan was to have each UFO stick to shooting one type of missile, but I couldn't get it to do that. So instead, each UFO can shoot both types of missile during one attack. I think this makes the game harder. Another thing I worked on was the left/right movement. Since the introduction of the horizontal moving UFO, having it stop at certain "stops" wasn't going to work, so I made it so in order to move the rocket, you keep having to press the joystick until you want it to stop and then it will stop. Some bad news for Frank the Fruit Fly likers. Since I can't figure out the save function in the Pokemon Mini, and since what I really wanted to do was have it save at certain areas, I've decided to put this game on the back burner. Some day, if I ever get the saving function in Pokemon Mini working, I'll pick it back up and continue. Not only that, it was too hard trying to think of certain scenarios to have Frank move through. Perhaps I'll try the new Pokemon Mini C compiler and make something for the Pokemon Mini that way. It'd be a whole lot easier.